Learning good manners and respect for others couldn’t be more fun! This course incorporates games, songs and fun activities so children stay engaged and retain the information. 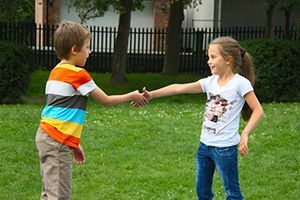 In this four-week course your child will learn social etiquette, self confidence, and integrity with an emphasis on respect and value for others. Home work will be given at the end of each class. Class size is limited to fourteen students, so early enrollment is encouraged. Note: Classes span over four separate days, and each class lasts two hours. Parents, we offer Summer Camp courses for this age group! Go to our Etiquette Summer Camp page to learn more! If you are interested in taking a class or course with It’s All About Etiquette, we would love to know a little bit about you. Please fill out our Enrollment Form so we may provide you with the utmost service. Please take advantage of our special enrollment credit. "My son took SueAnn's etiquette class and we were very happy with the results. He had such a positive experience and learned so much. Ever since he is setting the dinner table every night and points out things that my husband and I do wrong. I highly recommend SueAnn and her program!" "I sent my 2 boys (7yrs old) to her class and didn't know what to expect. The first day that they came home, I was pleasantly surprised to see the progress that they had already made. Both of the boys are very active, so I wasn't sure how they would feel about the class. Each time I picked them up they seemed excited and proud about what they had learned in class. Mrs. Brown was great with my boys. I recommend this class to anyone who needs it and/or for anyone looking for a fun activity for their child." "My son had a great time in class. He set the table for breakfast this morn and very much enjoyed it – he was so proud!" Looking forward to next week." "My seven year old son attended the etiquette class. He absolutely loved it. After the first class, he asked if he could attend the class two times per week. He was setting our table for dinner after the first class as well and continues to do so. My husband and I were quite surprised how much he enjoyed the class. We are delighted in the changes he has made in his manners. Thank you for offering such a great class for the little ones!!!"